SERVPRO of Floyd County will dry the home quickly and apply antibacterial, antiviral, and anti fungal agents to all surfaces that had contact with the water. This ensures the family can return to a safe home. SERVPRO of Floyd County recently got called to a home where the sump pump had failed and the customer had four inches of standing water in his basement. When SERVPRO of arrived on site there was no longer four inches of standing water but there was still a good amount of water throughout the basement. SERVPRO performed the necessary actions to remove the water and moisture from the basement using extraction methods, fans and dehumidifiers. When the dry out was finished our repair division replaced all the damaged drywall. In some cases your home owners insurance may not cover sump pump overflows. This is a good reminder to take a look at your home insurance policy to make sure you have coverage for sump pump failure. Sump pump fails are very common and you might want to make sure it is included in your home insurance policy. This slight increase in your monthly insurance cost could save you thousands of dollars in the future. A fire at your home or business is that of which nightmares are made of. Each year thousands wake up or come home to find themselves picking up the piece from the ashes of completely burned home. But what do you do if it is a smaller fire? 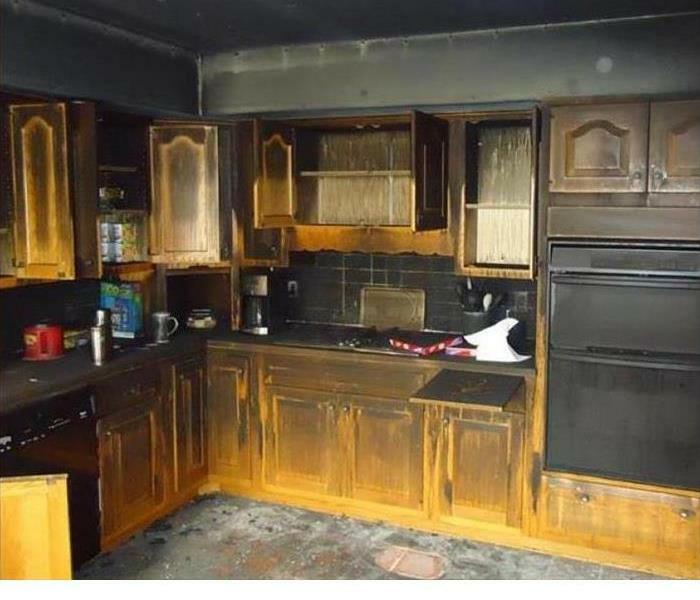 Maybe a grease fire in the kitchen that you where able to get under control before to much damage was done, or a candle that got a little out of control. In these situations smoke can be a bigger issue than the fire itself. It can stain walls and make furniture and clothing carry and odor that always reminds you of a mishap you would like to forget. At SERVPRO we can help no matter how big or small our trained techs can clean items affected by smoke. Let us help you if you find yourself trying to put this situation behind you. If you have experienced a fire at your place of business or in your home, many decisions exist after the fire has been extinguished. At SERVPRO we are happy to assist you and attempt to make some of these decisions easier with the services that we provide. Would you and your family know what to do if your home was affected by a fire. Being prepared is the best way to ensure your safety. 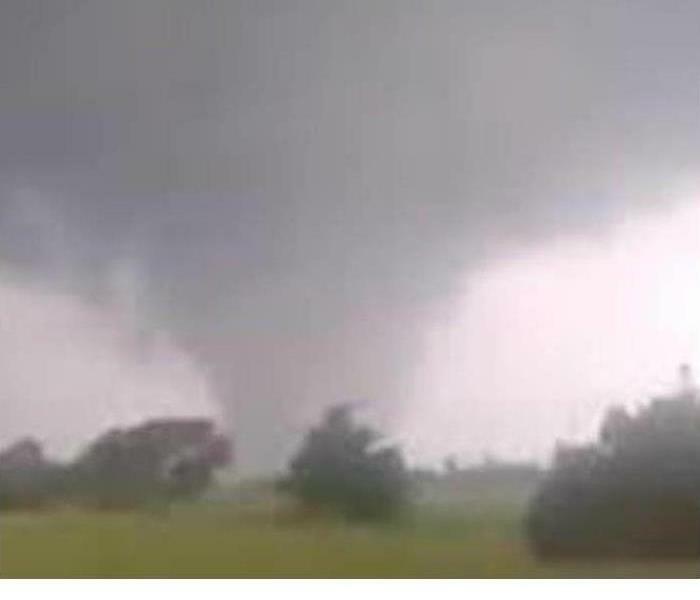 Here are 7 tips that can help make sure your prepared if you are faced with this disaster. 1.Install the correct number of smoke detectors . Test them once a month and replace the batteries at least once a year. 2.Teach children what smoke detectors sound like and what to do when they hear one. 3.Ensure that all household members know a couple ways to get out of every room of your home and know the family meeting spot outside of your home. 4.Establish a family emergency communications plan and ensure that all household members know who to contact if they cannot find one another. 5.Practice escaping from your home at least twice a year. Press the smoke alarm test button or yell “Fire“ to alert everyone that they must get out. 6.Make sure everyone knows how to call 9-1-1. 7.Teach household members to STOP, DROP and ROLL if their clothes should catch on fire. Fire damages are definitely catastrophic to your home or commercial building. Luckily with the tools, knowledge, and man power of our SERVPRO staff, we can take care of you with no issues. We like to put as little stress on the homeowner as possible during these difficult times. We know that it is a devastating time in the customers life, so we try to treat them like family, comfort, and console them by letting them know everything will be okay, and SERVPRO will have them back to new in a timely fashion. "Like it never even happened." Living by that quote and treating the customers property like its our own is very important to making them feel comfortable with our expertise in the field, rather we move out all of the homes contents, or clean everything on site. Working with sub-contractors for their clothes and textiles to get them cleaned and ready to bring back once the job is completed is something else we explain to the customer, but we also try to deal with the sub-contractor one on one to take even more stress off of the customer. Fires are very tedious and take longer than most jobs to complete since there is so much involved, but here at SERVPRO we do it professionally, and in a timely fashion. Our area as you know, has been hit by a serious amount of rain over the past weekend. We have a long list of claims that have called in, and SERVPRO is getting to your job as quickly as possible! During these times please try to be patient with us as we are working our best to get to you. SERVPRO insures we do the job correctly, so each job could take 3-4 hours, depending on the size of the job itself. If you are on our list we have not forgotten about you, and im stressing that we are working to our fullest potential to be speedy, yet officiant to every ones needs. The SERVPRO way! In the mean time there are things you could do to help salvage contents etc. 1. Try to remove any contents you can off of the wet floors, and move them to a dry location so they aren't sitting in water. 2. If you have capable hands, try to start removing some of the water with a shop vac until we can get there with our extractors and do a thorough job. The less water the better! If you have any questions at all before we get to your home, please feel free to call us! We would be more than happy to assist you on any concerns you may have! Thank you again for your patience and putting your trust into SERVPRO! 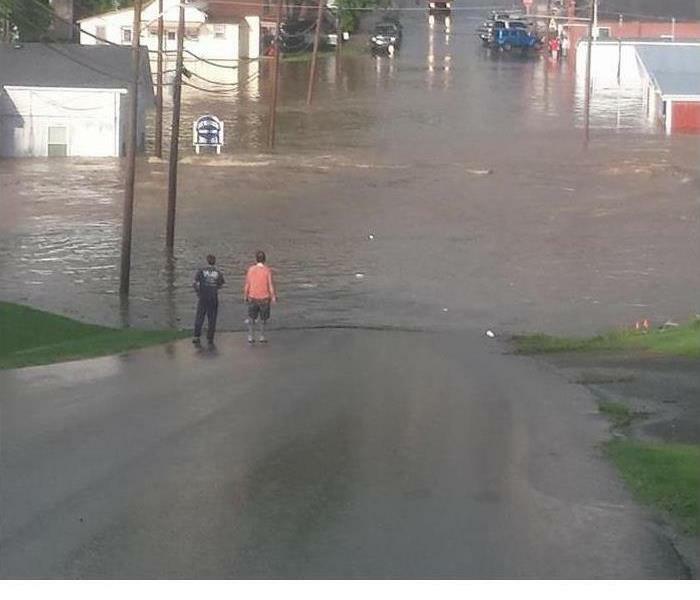 Shown in the picture is just one view of how much water flooded the town of Salem, Indiana. 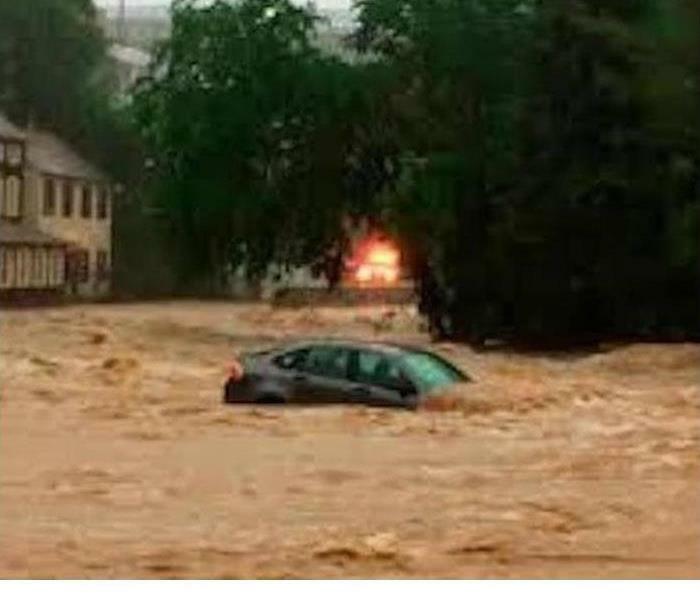 A state of emergency was declared in an Indiana county Friday after flooding prompted water rescues and inundated buildings and homes in parts of the Hoosier State. Torrential rainfall of 4-5 inches soaked the Salem, Indiana, area in a short amount of time late Friday, according to weather.com. The rain sent the Blue River into a record flood at 20.15 feet, which crushed the previous record level of 17.1 feet set in May 2004. SERVPRO has been taking calls all weekend to try and assist with this devastating flood. Of course we weren't able to get to the job sites until the water in the city subsided. They had rescuers getting people who were trapped in their vehicles out, and to safety. Now that the water has subsided a couple days later SERVPRO is able to make it to the job sites and start marketing to other home and businesses in need. SERVPRO is always on top of any flooding or catastrophic event that Mother nature deals us. While it is quite unfortunate, it is something we have no control over and SERVPRO is blessed to be able to help those in need is such desperate times. n any Hurricane situations one of the greatest dangers that face residents is not only wind and rain. Many times rising floodwaters cause the much of the damage and heartache. Although rainfall plays a role in this, so does the storms surge that pushes water not only onshore but up rivers and tributaries, causing floodwater to reach miles inland. These waters not only damage structures as rushing water causes foundations to erode and break loose from the ground to which they are anchored, but also carry with them deadly bacteria and disease. In many cases what is left behind after the water subsides, can cause great problems of its own. The trained professionals at SERVPRO have been specially trained for these scenario's. Let us be there for you in your time of need. With Hurricane Season upon us inland communities are faced with a different threat. As the storms travel further from the coast, the turbulent air can cause an all to familiar foe. An all to common danger is that of a spin off tornado coming from the bands of the storm. Much like a hurricane a tornado can produce strong winds that damage trees and homes. However, these weather monsters can spring up with little warning. If you find yourself affected by one of these situations and are not sure what to do next, At SERVPRO we can help. With services that range from water mitigation, to rebuild we can help prevent further damage by providing temporary coverage of roofs, or complete rebuilding options. We built our business on serving our communities in times of need. Let us help you in your time of need.